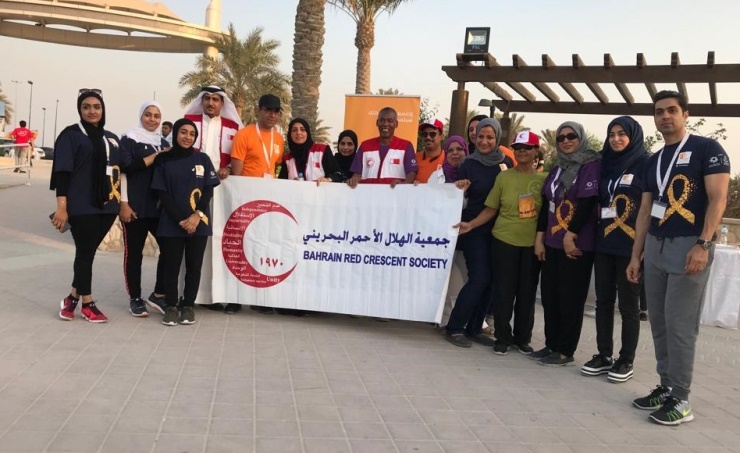 Manama, Oct. 3 (BNA): Volunteers of the Bahrain Red Crescent Society participated in the walkathon that has been held by Smile Initiative of the Future Society for Youth with the aim of supporting cancer-stricken children at Khalifa Bin Salman Park in Hidd. Volunteers’ participation included a one-kilometre walk at the park, with hundreds of civil society members and other institutions, who expressed their support to cancer-stricken children. Director General of BRCS, Mr. Mubarak Al Hadi, stressed that this campaign reflects the keenness of Bahraini community to participate through CSR, as part of its support for efforts to raise childhood cancer awareness. Mr. Al Hadi stressed the keenness of the society to raise awareness of volunteerism and expand the recognition of volunteers’ role in communities’ development, stressing the importance of voluntary acts in all areas of development, humanitarian, health and social levels.